– Masters On the Range – Special analysis from a live-streamed Practice Range show starting Monday, April 7th through Sunday, April 13th. – Masters Green Jacket Ceremony at the conclusion of Tournament play. Live radio coverage of the Masters Tournament starting Thursday, April 10th. Detailed hole information with imagery, flyover videos and 360 views from various positions on the hole. A round by round view of each day’s pairings that includes player action shots and easy navigation to find the tee time of any player. 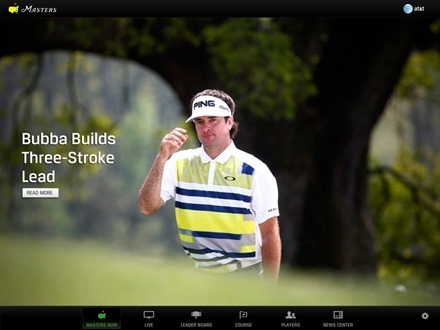 -Photo galleries of daily tournament action, rich course imagery and the tournament’s illustrious historical moments. 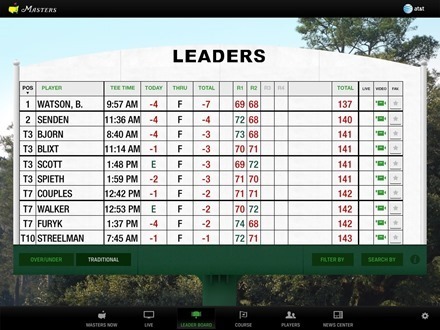 This app is perfect for anyone who can’t get near a TV set during The Masters or even as a fun and useful companion app while watching it on TV. One of the great things about this app is that it is genuinely free – with no hidden gotchas. No need to login as a subscriber to a particular cable company, no extra fee for seeing live coverage – none of that nonsense. The only restriction on live content streaming is that it is US only – which is sad, but I have a feeling that is out of the control of the app’s publishers. Here’s an App Store link for The Official Masters Tournament; it’s a free app.